I am sure if you perform your front arm raises like this some trainer will try to correct you and many others will think you are doing it all wrong. The reasons would be that “the delts stop working as you bring the arms high up” and “you should keep the tension on the delts”. Most people bring the dumbbells up until their arms are parallel to the floor which is a fine way of doing this exercise. However, the delts are still actively involved in this exercise as you bring the dumbbells high up, past the point where your arms are parallel to the floor. I recently read that the delts are still active as you bring the arms 40degrees above the parallel. As you bring the dumbbells past this point, you also start engaging the middle traps muscle, a muscle which adds a lot to your back development. 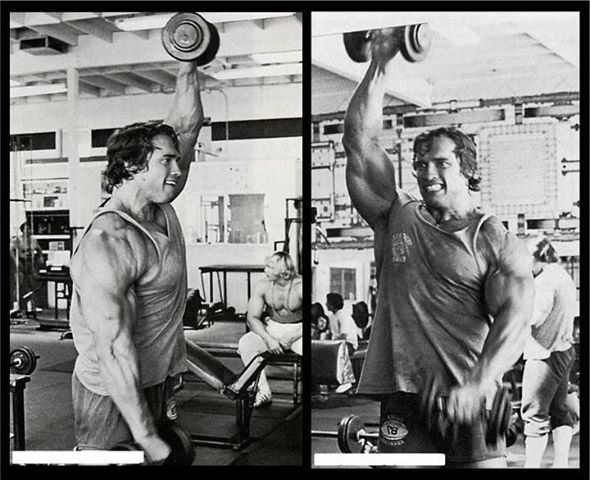 Arnold was known for performing his front raises in this manner and his middle traps were testament to this exercise’s effectiveness. Here is a video of him doing it. The only reason that going above parallel is not recommended is if you have a shoulder injury or some other shoulder problem. WARNING! I however guard you against using excessive weight on this movement and then use the whole body to swing the weight up. Do not do this. Maintain strict form. Look at the weight that Arnold used, I am sure he could have used 70lb dumbbells if he wanted to. Train not only with the muscles, but train with the mind.